There have been some absolutely gorgeous things sold recently on ebay. 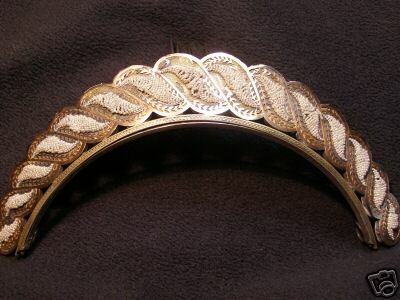 A French silver and gold tiara with seed pearls, c. 1810, had rings in the back perhaps for a veil, and a few metal comb prongs in the back, too, to hold it in place. The seed-pearl microbeading reminds me of antique French purses. It went for $1025. I must admit I cried because I didn’t win. 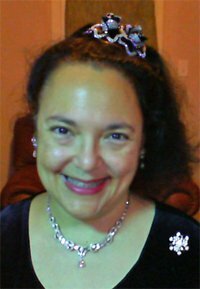 This is one of those once-in-a-lifetime finds for tiara lovers. 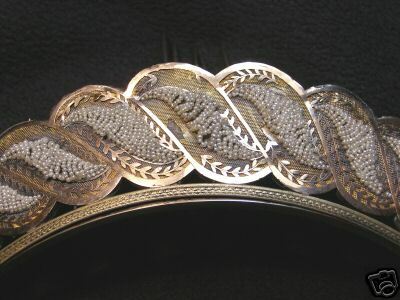 This beautiful plique a jour peacock comb with a seed pearl and art glass inserts had the DRGM mark. It stands for Deutsches Reich Gebrauchsmuster (German Reich Registered Design), and certifies that the piece was made before 1945. It sold for $1017. Plique-a-jour is an enameling process. The enamel is laid between thin raised metal lines and heated. 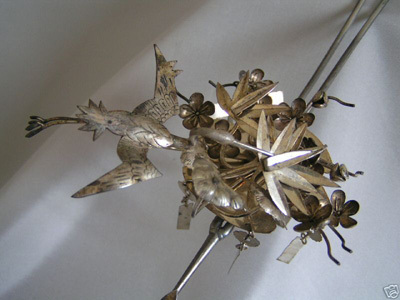 The finished piece has transparent enamel held between the thin metal wires. Making jewelry translucent followed the artistic movements of the day, as Tiffany’s favrile glass burned with light and painting became impressions of light. 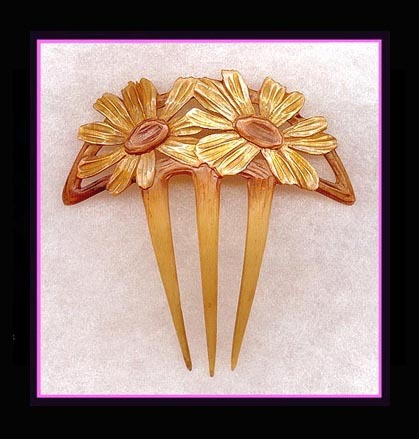 Two French art nouveau horn hair pins with seed pearls sold at an Ebay Live Auction for $516.31. I don’t know for sure, but they looked like Louis Aucoc to me. What value is in a name? 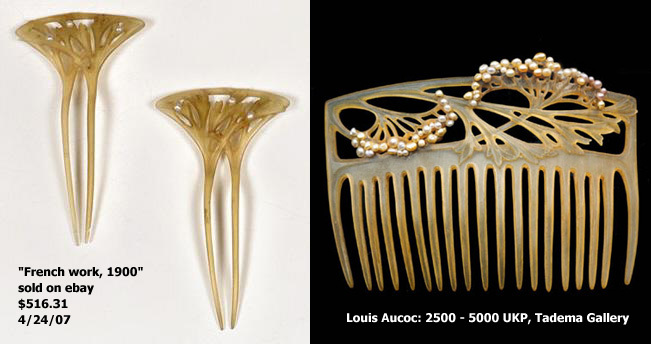 Here is a comparison between the hair pins and an Aucoc comb at the Tadema Gallery, listed in the 2500 to 5000 UKP range. Do we have a match? 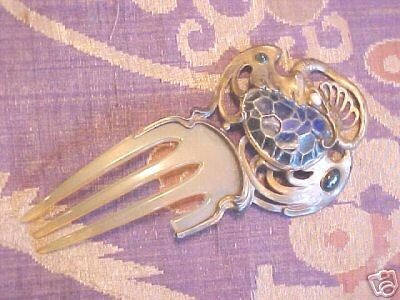 This lovely French horn art nouveau comb went for $102.50. 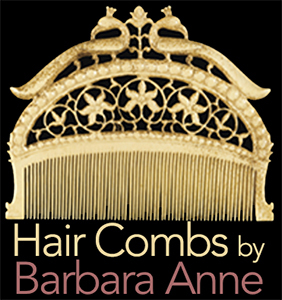 It was a modest, unsigned comb, but beautiful in its subtlety and shadow. I thought it was a fabulous buy. 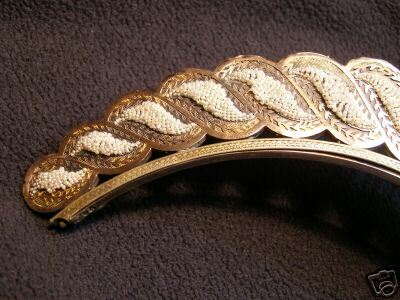 This French horn comb with rhinestone beads and bats, c. 1910, went for $679.35 at an Ebay Live Auction on April 23. 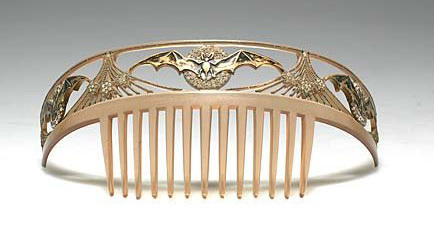 This George Jensen comb, c. 1909-1914, went unsold at $4000. It was tortoise shell with sterling silver flowers and 5 red garnet stones. Finally, here are three lovely kanzashi. 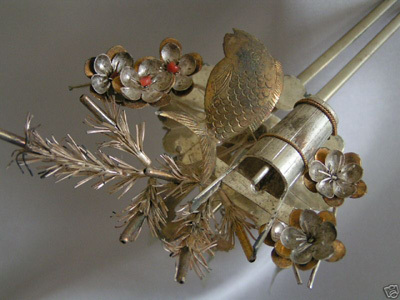 The first has a beautiful arrangement of plum, bamboo, pine, tortoise and crane, Japanese symbols of luck. It sold for $283. The second has pine, plum, and sea bream. The tub implies purfication. c. late Edo to early Meiji. Price: $341.67. 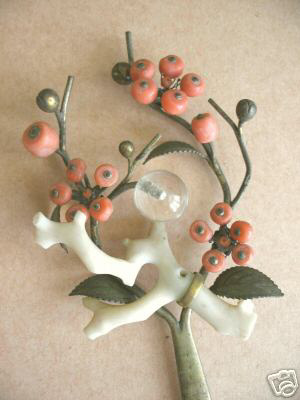 The third had coral blossoms on an ivory branch, and sold for $202.50.